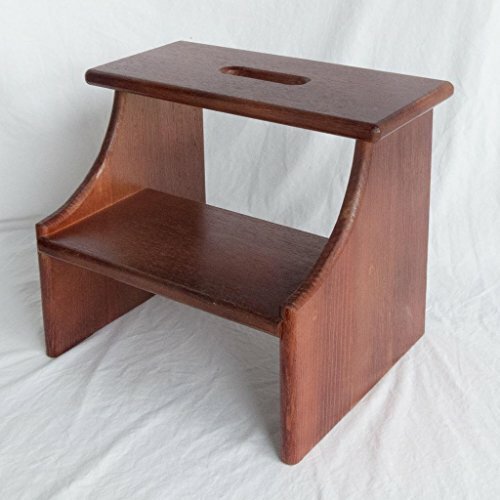 This wooden hardwood step stool brings elegant charm and is a versatile addition to the home or office to provide that extra height to access those hard to reach places. Perfect when trying to reach that container on a high kitchen shelf, clear cobwebs around the home or just climb into bed. Kids will love the step stool as they will now be able to reach the wash basin or kitchen sink, climb onto the toilet seat or simply turn off a light switch. The stool has a compact shape and can be placed conveniently around the home or office close where it is required. The stool has two steps that are securely fastened to the sides with a combination of rebates and screws. The top step has a cut-out handle for portability. The wide steps provide adequate support to one's foot and the freestanding stool has a wide base for stability. The hardwood Step Stool is handmade in Melbourne, Australia from solid Tasmanian Oak. We offer the stand in a choice of 6 stains (Clear, Baltic, Dark Baltic, Walnut, Mahogany and Wenge) and 2 painted finishes (White and Black). The featured hardwood step stool is in the clear finish.